511 Tactical 563960191SZ ALS/BLS Duffel Bag (56396) FREE SHIPPING! Gear Set compatible (Med Pouch Gear Set included), the ALS/BLS Duffel is ideal for fire, rescue and medical professionals who must work quickly and accurately under pressure. You can securely store your tablet in a clear, vinyl top compartment, a front pocket for first-grab items. 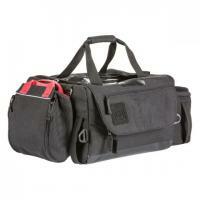 This duffel is durable, too. Constructed with a high abrasion-resistant 1050D nylon body and a waterproof 1000D poly bottom with double sided TPU, it stands up to every test. ©2002-2019 CopsPlus.com: 511 Tactical 563960191SZ ALS/BLS Duffel Bag (56396) FREE SHIPPING!